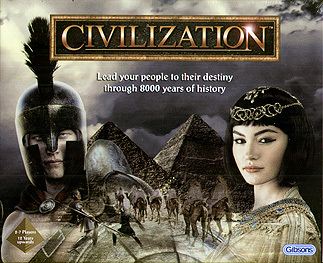 CIVILIZATION is a game of skill and strategy for 2-7 players. In the Ancient World of the eastern Mediterranean and the Near East, each player controls a different nation as they seek to become the most powerful and advanced civilisation. Although battles and territorial strategy are important, this is not a war game. The object of the game is to gain a level of overall advancement involving cultural, economic and political factors so that conflicts arise due to rivalry and land shortage rather than a desire to eliminate other players. Each full game can take 6-8 hours, but short versions are covered in the rules.